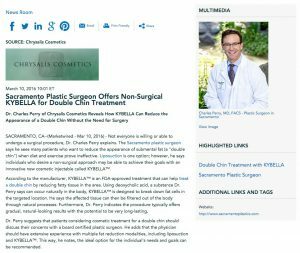 Dr. Charles Perry of Chrysalis Cosmetics reveals how KYBELLA™ can reduce the appearance of a double chin without the need for surgery. Sacramento, CA — Not everyone is willing or able to undergo a surgical procedure, Dr. Charles Perry explains. The Sacramento plastic surgeon says he sees many patients who want to reduce the appearance of submental fat (a “double chin”) when diet and exercise prove ineffective. Liposuction is one option; however, he says individuals who desire a non-surgical approach may be able to achieve their goals with an innovative new cosmetic injectable called KYBELLA™. According to the manufacturer, KYBELLA™ is an FDA-approved treatment that can help treat a double chin by reducing fatty tissue in the area. Using deoxycholic acid, a substance Dr. Perry says can occur naturally in the body, KYBELLA™ is designed to break down fat cells in the targeted location. He says the affected tissue can then be filtered out of the body through natural processes. Furthermore, Dr. Perry indicates the procedure typically offers gradual, natural-looking results with the potential to be very long-lasting. Dr. Perry suggests that patients considering cosmetic treatment for a double chin should discuss their concerns with a board certified plastic surgeon. He adds that the physician should have extensive experience with multiple fat reduction modalities, including liposuction and KYBELLA™. This way, he notes, the ideal option for the individual’s needs and goals can be recommended. Dr. Charles Perry is a Diplomate of the American Board of Plastic Surgery and a board certified plastic surgeon. A graduate of the University of Washington, he completed additional medical training at the Maricopa County Medical Center, the University of Arizona, and the University of Massachusetts. Dr. Perry is a Fellow of the American College of Surgeons (FACS), a member of the American Society of Plastic Surgery (ASPS), and the founder of Chrysalis Cosmetics in Sacramento. He is the recipient of several accolades, including the Leonard F. Peltier Chairman’s Award for Resident Research and the Macdonald Wood Resident Trauma Essay Award. He is available for interview upon request.